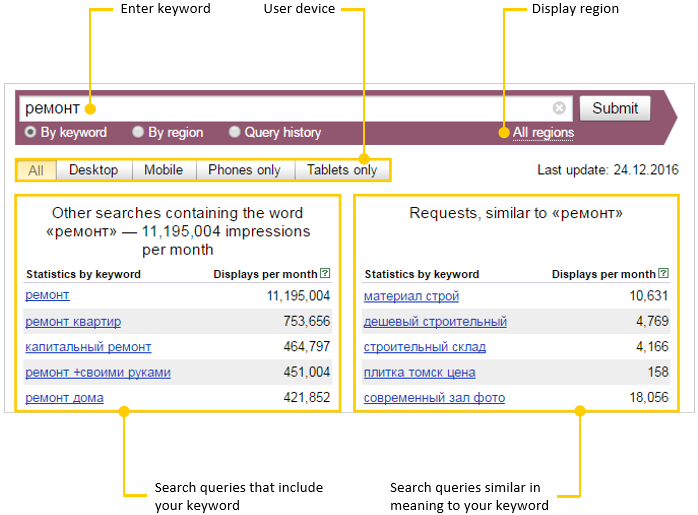 The keyword statistics (wordstat) service helps you find out what users are looking for in Yandex. For example, you can use it to see how many people per month are searching for a certain keyword, and then look at search queries that are similar to your keyword. You can use the keyword selection form in the Yandex.Direct interface. To do this, click Select words in the New keywords section, and enter a keyword. In order to use all of the available features, such as choosing the region and the type of user device, go to the keyword statistics service. You must be logged in to see keyword statistics. By default statistics are shown for all regions and all device types. The Desktop cross-section includes search queries from desktop computers and laptops, while the Mobile cross-section includes those from phones and tablets. To view data on search queries from phones or tablets separately, you can select the Phones only and Tablets only cross-sections accordingly. The number next to each query is the predicted number of impressions per month that you can expect if you use this search term as a keyword. The system forecast is based on data from the 30 day period before statistics are updated. The system only counts data from the Yandex search results, and does not include search terms entered by users in the Yandex Advertising Network search. Let's say you are using Yandex.Direct to advertise home repair services, and you want to add the keyword repair to your ad. Enter this keyword in the keyword statistics window. As the left column shows, repair is a popular keyword (11 million impressions per month). But it doesn't reflect what the consumer was looking for: repairing homes, cars, or phones. To avoid impressions for popular search terms that aren't related to your ad, change the keyword repair to home repair in Yandex.Direct. You can also use negative keywords to refine the keyword repair. If you add the negative keywords cars and phones, your ad won't be shown for the popular search terms car repair and phone repair. Look at the search terms in the right column. Uses who are looking for home repair might also be interested in remodeling and suspended ceilings. In the list of keywords for your ad in Yandex.Direct, add the keywords that match the intent of your ad. To understand the dynamics of user interest in your subject, go to the Query history tab. You can view data for the last two years grouped by month, along with a chart of user activity. Separate query statistics for tablets are available starting March 1, 2016. Before March 1, query statistics for phones also included queries on tablets.